(Bed sheet sets for bed sizes 150cm and 180cm include 2 pillowcases). 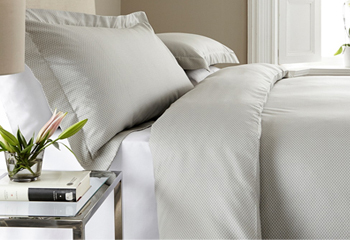 Add sophistication to your bedroom with this 200 thread count bed sheet set 100% combed egyptian cotton mercerized percale. White combines with contrasting ribbons in pastel colours and a delicate bourdon, a touch of class. A combed and mercerized cotton Essential , made with a delicate hemstitch: a must for your bedroom. Thanks to its wide range of colours and the high quality of this fabric you will be able to match them as you prefer. Set info: 1 Flat sheet, 1 Fitted sheet, 1 Pillowcase. (Bed sheet sets for bed sizes 150/160cm and 180cm include 2 pillowcases). Sheets of summer! Applied with a original and elegant design. The composition of 100% Combed Mercerized Egyptian cotton in 300 threads will give you a great sensation of softness and freshness. The Artisan duvet cover set has a "Boho Chic" design that will give your bedroom that point of luxury and elegance. Fitted sheet for mattres up to 30 cm in 100% egyptian cotton mercerized - TC300.